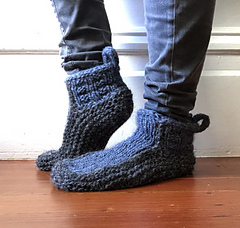 Cozy slippers are a must as the weather starts to get chilly. Keep your feet warm and banish winter’s icy chill with Colorblock Slippers! 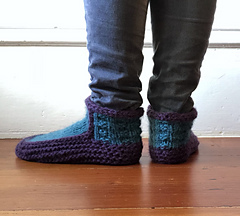 Colorblock Slippers are a quick, seamless knit. 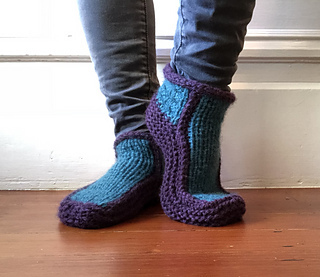 Choose to knit them in either a bulky weight yarn or a worsted weight yarn held double. 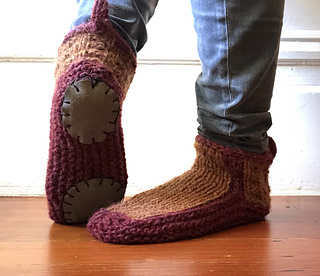 Contrasting color detail and subtle patterning on the cuff help set these slippers apart from your average, ho-hum, house slipper. In fact, one discerning wearer has already declared them “definitely nice enough for company.” Colorblock Slippers are sized for children to adults and instructions for adding a custom-sized split-sole to any pair to improve traction and durability are included. Links to tutorials are included! The instructions are written (not charted). Finished Dimensions: vary by size. Materials: 82-176 yards (76-162 meters) of bulky weight wool yarn or 192-416 yards of worsted weight wool yarn, depending on the size. Suggested Yarns: This project requires 1 skein of each color of Ístex Álafoss Lopi (100% Icelandic wool, 109 yds 100 m/3.5 oz 100 g) OR 1 skein of each color of Fancy Tiger Crafts Heirloom Romney (100% United States Romney wool, 200 yds 183 m/4 oz 112 g). NOTES: Size 6 requires 2 skeins of worsted yarn in color 1 (or your willingness to use color 2 to bind-off the cuff and attach the sides). Yarn substitution may increase the amount of yarn required for a given size. One additional needle in the same size (or close to the same size as circular needle) for three-needle bind-off.